MOTD ransomware uses sophisticated techniques to infiltrate computers and hide from its victims. Use Reimage to determine whether your system is infected and prevent the loss of your files. What damage might cause MOTD ransomware virus? How to withdraw the MOTD ransomware from the computer safely? MOTD ransomware is a new file-encrypting virus that uses RSA cipher  to encode files on the targeted computer. Usually, ransomware-type viruses use AES encryption or combination of AES and RSA algorithms. The motives why developers used this algorithm are unknown; thus, it’s clear that malware differs from other file-encrypting viruses that are currently spreading on the Web. 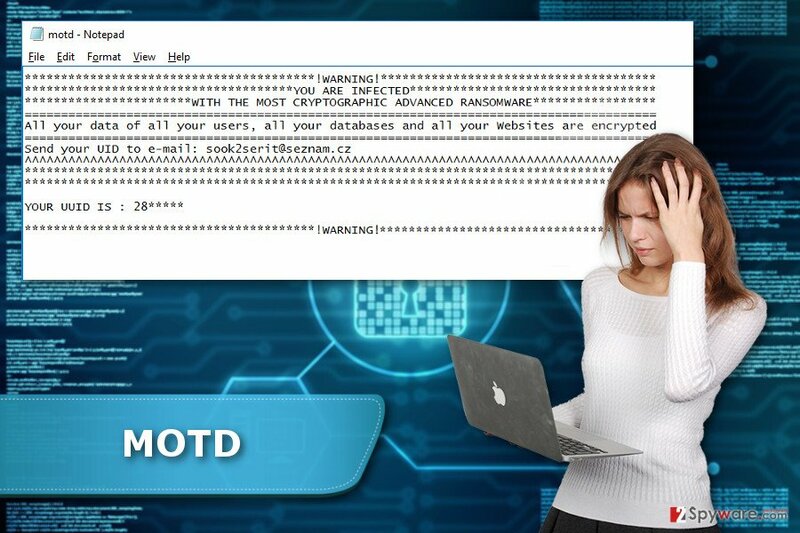 Malware researchers suggest that the name of the virus is an acronym which stands for “Message Of The Day”  — which is widely known saying in the IT world. Apart from encrypting the files, MOTD virus also aims at web servers and might infect websites. This feature allows it to stand out from other file-encrypting viruses and cause people more damage. What is more, developers of the ransomware might get access to the affected computer. As a result, they might install other malware or try to steal personal and sensitive information. Thus, we highly recommend scanning the system with Reimage or other malware removal program as soon as virus appears on the computer. Detailed instructions how to remove MOTD are presented at the end of this article. MOTD ransomware virus might attack individual computer users and web browsers. The MOTD virus aims at widely used files, such as MS Word documents, different types of image, audio, video files, databases, etc. As we mentioned at the beginning, it uses RSA cryptosystem to take data to hostage. However, it also appends the .enc file extension to the corrupted files. Thus, encrypted files easily differ from the safe data. Though, you should not expect that the virus leaves some of the important files untouched. In order to get back access to your files, you need either data backups or specific decryption key. When MOTD ransomware virus finishes messing up with files, it drops the ransom note in the motd.txt file. Victims are supposed to contact cyber criminals via provided email address (sook2serit@seznam.cz) and send their unique ID number provided in the ransom note. However, following cyber criminals’ orders is not recommended. We can reveal that people standing behind the virus will ask to pay the ransom which might be up to 2 Bitcoins. The size of the payment might vary due to a number of encrypted files. However, no one can assure that hackers have the decryption software and are willing to restore the files. Thus, we believe that it’s better to initiate MOTD removal and think about alternative data recovery options or wait for the official decryption software. Authors of the MOTD ransomware use a combined distribution techniques and strategies. As you already know, the virus aims at both – home computer users and web servers. Obviously, hackers need different strategies and tools to launch successful campaigns. It seems that the virus might affect web servers with a help of vulnerable WordPress plugins. Meanwhile, other computer users should be aware that the virus widely uses exploit kits  to infect devices. Though, the best prevention of the ransomware is up-to-date software. Additionally, people might encounter MOTD malware if they download programs or files from various file-sharing websites or P2P Networks, click on the malicious email attachments, links or ads or install bogus software. Hence, if you haven’t encountered this crypto-malware yet, please take all necessary precautions and make data backups. They are crucial in case of emergency. Some cyber parasites can be deleted from the system manually; however, MOTD removal must be performed automatically. File-encrypting viruses are complicated cyber threats that might be hiding in the system and pretending to be legitimate files or applications. To avoid irreparable mistakes, you should install professional malware removal tools and run a system scan. To do that you may need to reboot your PC to the Safe Mode with Networking. The instructions below will help you to deal with all obstacles and remove MOTD entirely. Sometimes ransomware-type viruses prevent users from installing or running antivirus software. In this way, malware protects itself and makes removal procedure complicated. However, if MOTD ransomware virus prevents you from scanning the system with malware removal tool, you need to reboot your computer to the Safe Mode with Networking. When in Safe Mode, install the program and run a full system scan again. Log in to your infected account and start the browser. Download Reimage or other legitimate anti-spyware program. Update it before a full system scan and remove malicious files that belong to your ransomware and complete MOTD removal. If the previous method hasn’t helped you to disable the virus and activate virus removal tools, follow these steps. Then, try scanning the system again. When a new window shows up, click Next and select your restore point that is prior the infiltration of MOTD. After doing that, click Next. Once you restore your system to a previous date, download and scan your computer with Reimage and make sure that MOTD removal is performed successfully. Guide which is presented above is supposed to help you remove MOTD from your computer. To recover your encrypted files, we recommend using a detailed guide prepared by 2-spyware.com security experts. If you do not have data backups, your chances to recover your files are not high. However, this fact should not encourage you to pay the ransom for the cyber criminals. No one can assure you that they are willing to help you. Thus, save your money and try additional data recovery methods. Hopefully, they will help to restore at least some of the files. Windows Previous Versions feature allows getting back in computer’s time and copy previously saved versions of the encrypted files. However, this method only works if System Restore function has been enabled before ransomware attack. We are sorry, but the official decryption software for the MOTD ransomware virus is not available yet. ^ Public Key Cryptography and The RSA Cipher. Invent with Python. A free ebook programming tutorial for the Python programming language. ^ Motd (Unix). Wikipedia. The free encyclopedia. ^ Computer Hacking and Identity Theft. PrivacyMatters. Online Credit Score, Identity Theft. ^ Forrest Williams. Understanding Exploit Kits: How They Work and How to Stop Them. Barkly Blog. The latest endpoint security news, tips, and actionable insights. ^ Ray Holt. 7 Ways to Protect Yourself from Ransomware. NovaBACKUP blog. Backup Software for Windows Servers. This entry was posted on 2017-03-20 at 06:33 and is filed under Ransomware, Viruses. You can quickly scan the QR code with your mobile device and have MOTD ransomware virus manual removal instructions right in your pocket. How did you remove MOTD virus?